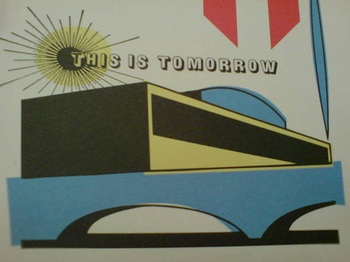 I've just come back from the first outing of a fantastic film called This Is Tomorrow, made more fantastic because it was at the place it was about (if that makes sense) - The Royal Festival Hall. And the music was performed live by Saint Etienne and a youth choir and orchestra. The evening had all the ingredients guaranteed to bring a lump to the throat; school orchestra children waving at their parents, lots of bunting and a glorious vision of a socialist utopia. Really good stuff. It had a lot of the spirit of one of those post-war films made by the GPO film unit; it is, after all, celebrating a governmental/commercial enterprise, it should theoretically be weighed down by the dread hands of bureaucracy and commerce, but instead it had the same lightness of touch and awareness of the beauty of the ordinary of those GPO films. I wonder also if some of the affection I have for bunting comes from soaking in Festival Of Britain things over the years, I think we caught something of the spirit of the festival at Interesting, and maybe it was to do with the bunting.